Safety First in the Bathroom. How to prevent accidents in the bathroom. If you are a regular visitor to Hints and Things you will know I have tried to keep away from advertising banners and product promotions even though these may generate some funds to cover the costs of maintaining the site. When, however, I receive recommendations from visitors which I feel would benefit others I have no hesitation in passing the information on - the following story I received from Al Tosci is just such a case. Two months ago my four year old granddaughter slipped in the bathtub and hit her head even though my daughter-in-law had her standing on a mat at the time. Since I live 3000 miles away I decided I would source the internet to see if there was anything that might do better. I went from website to website but found only mats and rails. My wife and I took a vacation to a hotel in Rehoboth, DE and I went to take a shower and I noticed there was nothing in the tub. I called the front desk to ask where a mat was and they said it wasn't necessary as they had installed a "treatment" to stop slipping. I proceeded to shower and I didn't budge. I went to the front desk and they had me speak to the hotel engineer. He told me that he has been using this treatment for years in their property. I asked him the name of the product but it was only available to commercial users. He called the company right then and discovered that they had just set up a home user site on the internet. 1st May, 2004 - Mr. Tosci has just contacted me again to say this product is still working well. 29th August, 2017 - I can no longer find this site online but have left the item here just to make people aware that there maybe similar products available. Lock all medicines out of the reach of children. Shower doors should be made from safety glass or heavy-duty plastic. Always run cold water before the hot to prevent accidental scalding. Never leave children alone in the bath. Always check the water temperature before getting into the bath. 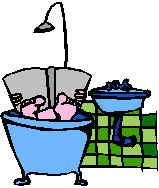 Always remove soap from the bath water to prevent slipping. Keep electrical items, such as hairdryers, radios, shavers etc. away from the bath or basin. Use non-slip mats or strips on the bottom of the bath. Handles attached to the wall can prevent accidents when getting out of the bath. Never use electric fires in a bathroom unless it is specifically made for the purpose. SEE ALSO SAFETY FIRST IN THE LIVING ROOM AND KITCHEN.